Sam Jones was known for his quickness and game-winning shots, especially during the NBA Playoffs. He has the second most NBA championships of any player (10), behind his teammate Bill Russell (11). He was also one of only 3 Boston Celtics (along with teammates Bill Russell and K.C. 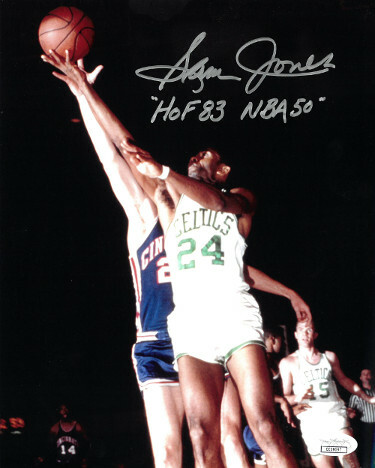 Jones) to be part of the Celtics's 8 consecutive championships from 1959 to 1966. He is a member of the Naismith Memorial Basketball Hall of Fame. Sam Jones has hand signed this Boston Celtics 8x10 Photo with dual HOF 83 and NBA 50 inscriptions. JSA Hologram and Certificate of Authenticity.